WHO LOVES YOU? Today was a special day at The Loft – The Woodlands United Methodist Church – The Woodlands TX. I was reminded thru an impactful sermon and worship- THE LOVE YOU SWORE - http://www.songlyrics.com/john-mark-mcmillan/love-you-swore-lyrics/ .Click on link and turn speakers up! David Dunn sang this acoustic guitar- amazing! Is something in your Life making you scared and afraid? Or paralyzed by fear? Career, family, health concerns, you name it? If so, the above lyrics are some sweet reminders who “harbors us in the eye of the storm”, makes our path straight and full of Joy. Being afraid is normal, and it’s uncomfortable- especially when you push the envelope to make an impact, defend your family, raise your children, and glorify God. So what do we do in this state of mind of fear and being afraid? Hold on to the Love HE Swore! Let’s live in Joy and not let the devil take us down. The evil forces are all around us- so how about we dance to the Fear and allow God’s Will to conquer it – with THE LOVE HE SWORE? The 3 “C’s” are something to remember and to wear on our breastplate of God’s Armor. Thank you Andy Nixon. Communion- I am not in control, completely give up the reigns and sword to the All Mighty and share in the intimate fellowship of Believers. Community- Real Friends helps us remember what matters most- the eternal things. Stay connected and serve – the Devil hates a cohesive authentic Community. Community fights our fears! Compassion – Joy means eternal things, and can help us set aside the fearful afraid moments. Compassion will direct our focus on enduring community + passion = Joy. If we get the focus off of just “me”, and onto others, we glorify Christ, we put Life in perspective and the rest should work out to His plan. I’m Holding on to the LOVE YOU SWORE! I have been blessed to be surrounded by some of The Woodlands and Houston top community leaders and have learned what makes them tick. It has nothing to do with their selfish “I” motivations. To the contrary, it is a selfless humility and professional curious will to never be satisfied while serving others. Here are some of the takeaways of the 5 “I”s- and it’s not all about their own “I”. Manvel is the best up and coming real estate in the Northeast. 1. Insight – they possess empirical creativity and curiosity to make a difference - just like Jim Collins says-Great by Choice. 2. Initiative – leaders take the first step and make a bold calculated move – “think _ do” iterations- even if they fail. 3. Influence- Are they following us? They are respected and revered thru their actions- not words? 4. Impact- this is paramount to the leaders purpose – a Distinctive Impact. This drills down into your “why”. 5. Integrity – arguably the biggest of all 5- always do the next right thing! Do these above match your leadership? Are you leading and inspiring or managing? Are you embracing your fear, and dancing with it? Are you able to change and not play it safe? Are you tracking on all 5 above- every single one? It’s a challenge and that makes it so special. Hitler and Stalin had #’s 1-4… but not the main thrust of # 5- no Integrity sinks the ship. Integrity is when your ethical actions do what you say you will do. We need this now more than ever. The Woodlands and commercial real estate is growing leaps and bounds, (as I hope your industry and space are as well) - so it’s imperative now we all grow together in impact, integrity and trust. Join the club and sign up at www.bandierinsights.com for more stuff that matters in this game of LIFE. Thank you Leaders, you are all inspiring to us as we continue to Lead the way you teach us – starting with the five “I”s. Friends:The answer to Houston transportation and mobility continues to happen before our eyes. See few photos below I took while driving the ExxonMobil impact area this week. As an early adopter to this game changer, I will continue to give you the XOM mega campus periphery beat (we love the Oil and Gas Tiger). Thank you to Grand Parkway Association http://www.grandpky.com/home/ and Zachry Odebrecht Parkway Builders along with Springwoods Village and ExxonMobil. Houston continues to dream big and execute. Zachry Odebrecht most recently leased some land from us - shown in picture 2, and put it to use as quick as you can say ”H-town”! “If you build it, they will come.” Or maybe,..” if you come, they will build it?” And another one liner to embrace …”There is a time to move fast, and a time to move slow”- you guessed the season we’re in. Parkways, byways, highways, flyovers, 3rd loops, TX ROW condemnation, new communities, sustainability, net absorption, commercial real estate, mixed use projects, multi-family, residential, oil and gas Majors – bring it all and the kitchen sink! Come on over and in, the water is warm, so just stay. YOU know who you are and where you (or your clients) want to be. Abundance Mentality = there is plenty of business, projects, faith, community and connectedness to go around and the critics need not apply. “The Trey Take-away” – If you would like to discuss some more commercial real estate, ethical capitalism and ”work that matters”- contact me and we will make this community even a better place- deal by deal, project by project, connection by connection, trust by trust. Also, sign up for more insights at www.bandierinsights.com – and connect! As you thrive in your career, what is your secret to significance? I keep learning more about the top leaders in the world and what they possess others do not. There is one common set of factors I find compelling in these change agents. They operate in the intersection of their 1.) very top strengths and 2.) what they are most deeply passionate about. They operate in this specific space above (and in the industry, field, impact zone) and stay hyper focused in that space. They step into their Sweet Spot and stay there. This can be defined as your “sweet spot” where you seem to be effortlessly performing by outsiders. Top athletes will describe this as being “in the zone”. Life gets busy, and is very chaotic. Why do we need to feel safe? Why do we gravitate to security or normalcy? Why are we scared of the unknown? Are you really pursuing what makes your being thrive? It’s time to think “you, your strengths and your passion” to make a distinctive impact. I look forward to us making more concentrated effort into this “labor of our specific love and work that matters”. Take time to figure it out. As one thought leaders says, it’s not just “being at the right place at the right time.” More so, it is “being in your right place (sweet spot), and the right time happened”. We did not throw a big party. We did not go to some special steak dinner. I did not even blow out candles and eat a birthday cake. Instead, I took my almost 5 year old first daughter dancing at The Woodlands United Methodist Church and then TCBY. What an impression that made on me – and thank you for my friends who joined with their lovely daughters to dance and laugh the night away. 35 years can do a lot to a man. That is over 1/3 of a man’s useful life after-all. One thing becomes certain now. What really matters in our precious lives? No one will ever take away the JOY my daughter – Lyla and I felt tonight. That is embedded in my memory bank forever! All our work, all our stuff, all our issues, all our pain, all our busy life schedules, all our worldly things – are nothing compared to a Father and Daughter’s love! As the years pass by, I can now better understand my Mom’s love for her father, my sisters’ love for my own Dad, and my wife’s love she had and still has for her Daddy- it’s quite amazing! We all have strong beliefs in someone and something, so how do we make this relationship more intimate? Are just a few close friends good enough? If so, why is that? So, then what is the purpose of artificial friends? Is our belief in a Higher Power (for us Christians- CHRIST) the most important Friend and are we letting Him in? Can you Thrive in Life by making a few more real Friends and rely on those close ones to you? “MAKE A FRIEND” …hmmm. I love Christ, I love People- and I love real authentic sacrificial Friends-…. so maybe one of life’s major “impactful” treasures is to focus on my enduring loving friends who share the same conviction and core values? With maturity comes a sweet realization- who are our real Friends and why do we need them? Are YOU in the Game? If you are in – what game are you playing and WHY? Are you playing it to win or serve- or both? wondering if I should go the safe corporate route, or blaze my own trail – is it risky now to play it safe I wonder? The game is brutally tough, it requires morals, sacrifice and fanatic discipline- even after playing and practicing in this game for years it still hurts. The ref’s and other team (and the sport itself) are not always fair- and neither is life. But can it be purposeful and equitable? But, here is the key- we all have the ability to suit up and get in the game in business and life - with the main difference is YOU don’t have to run a (4.2) 40 yard dash and have 3% body fat. How do we not get knocked down so much- and then think about getting back up- or do we think at all and just get up? We are resilient Americans (Texans) right? The game- just like the eternal life- requires this- unwavering FAITH. Pro golfers win the Master’s between the 6 inches between their ears. Believers, Family, Community, and Faith based Business leaders all know this sage wisdom _ belief. The best part is, when “you are in the zone” and it’s His glorious zone- it is genuine, right, authentic, and can be felt by everyone. My faith is being tested, as is yours on a daily basis, in this game of Business – so don’t let it change your Life and knock you down permanently. No way, we get up, dust off the dirt and continue on not thinking twice (other than some serious reflection and prayer). Do Faith for your God, your Family, your Community, and Yourself. Always – keep the FAITH, make an Impact and Thrive in YOUR game. The Glory, we will find – is not just for ourselves or boss or team, but….maybe, even more than definitely, for the one who created the Game and your Life in the first place. Enemy- it’s not. It takes adversity to make success. Failure is fertilizer to success. Irreversible- it’s not. See the big picture. Take it in stride. A Stigma- it’s not. Mistakes are not permanent markers. They are stepping stones. Is final- it’s not. There is a new return that makes you stronger. Apostle Paul- “I have learned in whatever state I am in, I am content.” FAITH is key. Are we going to avoid failure or wake up and embrace success. Failure is a price we pay to achieve success. Get this definition engrained in head. If you failed, are you a failure? NO. Bounce back- life is a series of outcomes. Rudy the football movie. Purposelessness- feel every day I must make mistakes- its natural to success. No self pity and hopelessness. Feel fear and take the action. When you get going, its gets easier. It all starts with action. DANCE WITH FEAR AND FAILURE- it is part of the growth. Ahhh….the sounds of Cranes and Beeping Construction Dozers on site in The Woodlands. Thank you Howard Hughes and James Warmack (2 of our esteemed developers) – and my mountain bike – for this amateur video I shot on Ironman Weekend here in The Woodlands. Take in the sights and noises of an office construction frenzy in one of the hottest markets in the USA. Some would say we boast a 0% Class A office vacancy rate. If you build it, they will come to The Woodlands. 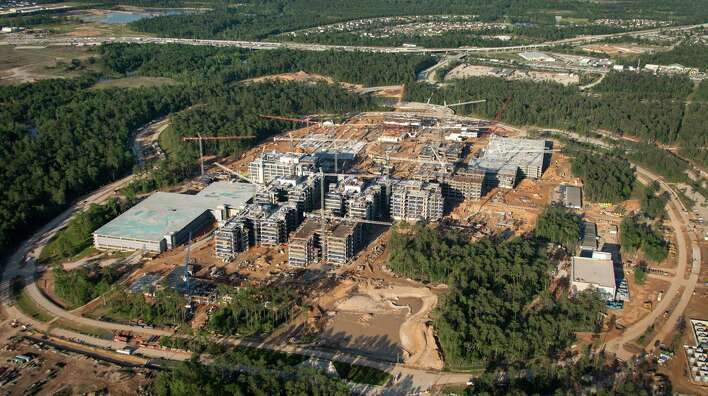 ExxonMobil Aerial near The Woodlands TX – Commercial Real Estate is HOT! ExxonMobil updated aerial. The Woodlands TX Commercial Real Estate is “en fuego” around the area. I have some more inside scoop to share on another energy giant moving and shaking in the area. Email me to discuss at trey@bandierpartners.com or call 713.320.9494. Stay connected! Receive Insights _ Posts by E-mail! Get the latest BANDIER Insights articles delivered straight to your inbox for free! Your address will not be shared with anyone and you can unsubscribe at any time.